Hello everyone! 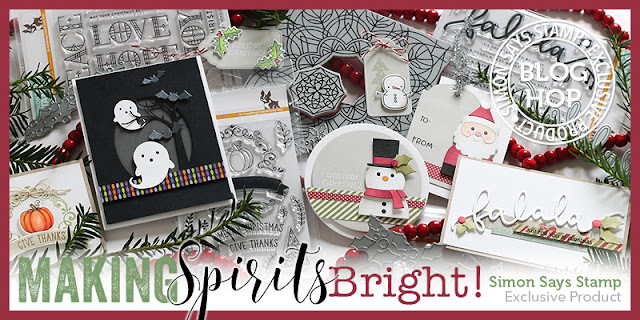 Welcome to Day 2 of the "Making Spirits Bright" Blog Hop! If you haven't seen the newest SSS collection, check it out here! Isn't is super fun? ¡Hola a todos! Bienvenidos al segundo día del blog hop "Making Spirits Bright". Si todavía no habéis visto la última colección de Simon Says Stamp, podéis echar un vistazo aquí. ¿No es super divertida? Have you noticed there is a looong list of amazing dies in this release? I like them so much I decided to use three of them to make my card today: "Snowburst Collage", "Picture Book Deer" and " Fa la la". ¿Habéis notado que hay una lista larguísima de troqueles en esta colección? Me gustan tanto que he decidido usar tres de ellos para hacer mi tarjeta: "Snowburst Collage" "Picture Book Deer" y "Fa la la". To make the background I used the "Snowburst Collage" die three times on a 5 1/2" by 4 1/4" piece of cardstock and added color to it with dye inks. I also die cut the sentiment and positioned it across a frame I created with the "Stitched Rectangles" die. Para hacer el fondo he usado el troquel "Snowburst Collage" tres veces sobre una cartulina tamaño 5 /2 x 4 1/4 " y le he dado color con tintas. También he troquelado el sentimiento y lo he colocado sobre un marco que he creado con los troqueles "Stitched Rectangles". That deer is one of the cutest dies I have ever seen! I colored each part with Copic Markers and then put them together on my card. I added Nuvo Crystal Drops to the eyes and Crystal Glaze to the nose. Ese ciervo es el troquel más cuqui que he visto en mi vida! He coloreado cada parte con rotuladores Copic y después he juntado las piezas sobre mi tarjeta. Para los ojos he usado Nuvo Crystal Drops y para la nariz Nuvo Crystal Glaze. Simon Says Stamp is giving away a $25 coupon to every stop on the hop from our blog comments. Just leave a comment below for a chance to win and check Simon's blog next Tuesday to know if you are one of the lucky winners! And don't forget to visit yesterday's blog hop for more inspiration and prizes! Simon Says Stamp sortea un vale regalo de 25$ en cada parada del hop. Lo único que tenéis que hacer para participar es dejar un comentario en esta entrada. Los ganadores se anunciarán en el blog de SSS el próximo martes. ¡Suerte! Your next stop is JESSICA FROST-BALLAS!!! Beautiful work! Thank you for the ideas! Great cards! I appreciate the inspiration! WOW I love this card SOOOO cute. Super cute card-love that little deer & the background! What a cute, cute card!! Love that little deer! Very cute! Thanks for sharing your ideas! Oh my gosh this is just adorable!!!! Absolutely adorable! That reindeer is just too cute! And I love the background. This is such a great card, I love the dimension! I love that little deer peeking up from the bottom of the card, he's too cute! Oh my!!! Super super cute!!! I love your background with the die... Great card! Your deer is so darn adorable!! You made the die cut come alive :) Thank you for the great inspiration. I just love this darling deer!!! You sure made him shine!! OH!!! in LOVE with it SO cute!! My 2nd visit today. I'm so glad to have found you through these hops (my first go at them). I thoroughly enjoy your work. I can't wait to explore more. Love this Idea wonderful design. Beautiful card, love the background and the adorable deer. I love your card! I think that deer is my very favorite thing in this release. He is so cute! Love the cute reindeer and the background is so pretty. Thanks for the inspiration. Super adorable card, LOVE that snowflake die cut and ink blended background for the super cute deer... awesome copic coloring too! Love that little deer peeking through the window and the die cut snowflake add so much. Cute card. That little deer is just darling! The snowflake background is just perfect. Love your card! Thanks for the inspiration on how to use the dies! Love your background! Oh I totally squealed when I saw your card! Not only have you used my favourite products from this release - you have also done an absolutely amazing job with it! LOVE! I agree, the dies this time around are all great. Not that I don't want some of the stamps too, just that the dies as a group are clearly a notch above! I like the way you combined these three! Thank you. I love this card Amanda! Everthying about it is perfect, the layout and design. Super adorable! Just love those two dies, they are high on my wish list. You card is just gorgeous! Wow!!! This is Super Duper CUTE!!! I love the die cut background!!! This is SOOOO adorable! It's awesome! Beautiful card!! I love the diecut background and the stacked dies for the sentiment!! Amazing! What an adorable card (just love that deer). Your blue background just makes it all pop...love it! I love the little deer peeking over the background - I'm often unsure of how to use the dies to make backgrounds - yours is fabulous! Cutest reindeer ever! Looks a bit like he photobombed your card! Your deer is so cute looking up. I just imagine that he is startled to see someone watching him after playing in the snow. Falala is the perfect sentiment. Your reindeer card is so adorable! So cute! And I agree - so many amazing dies with this release! I love this card. The deer is adorable!!!!! Such an adorable card. Love the background and everything about it! Thanks for the tips on it's creation! thanks for the inspiration! Love your card! Your card is ADORABLE!!!! Love it and this amazing new release!! Your card is so cute. The expression on the deer is so cute. Love your design and color choices. So sweet. Super cute card. Thanks for the idea. That deer is absolutely adorable. great card. love the large sentiment dies! I had to get the little deer, too! The little deer is darling, I better add it to my wish list. Such a cute card!! I love the adorable deer! Darling picture book deer. I love your scene, and can't wait to get my hands on that snow burst die! I love the way you used the "Snowburst Collage" die! Such a fun card with that deer! Your deer and background are beautiful! what a wonderful creative design- love this card!! My absolutely favorite from the new release!!!! Thank you for sharing your talent. Super duper cards! Great release. Beautiful card! Love that deer and all of the products you put together. Thanks for sharing your beautiful card. Love how you coordinated a number of dies. Love that wafer die background! So much cuteness - love this! I love this design. The picture book deer is my favorite item from this release. I agree with you that he’s the cutest deer I’ve ever seen. Love your creation and I’m having a second look at the Snowburst Collage die, seeing that the other 2 are already on my wish list. Thanks. Your card is adorable ! Your colors are perfect, the way you made Rudolf pop-up from the side is awesome, really a fabulous card ! Love how you made the background! Love that "Snowburst Collage" you've used for the background. I agree! The amount of beautiful dies in this release is amazing! I love your background using that die! Love love love - especially that die with the shadow. That deer is so cute! The reindeer die is so cute and your card is beautiful!! Cutest reindeer ever! Beautiful card. That little deer is just the cutest! Thanks for sharing your beautiful card!! Wonderful colors and design! Very cute! Wonderful look of framing for a shadowbox look for this cute Deer. Love your cute card with the deer and the beautiful blue background. Thank you for sharing. Love your use of the snowburst collage for the background. Just perfect. What a cute and adorable card ! The position of the sentiment across the frame is great ! Thank you for sharing your creativity. I know the deer is on my wish list. So cute! Love your clever use of the Snowburst collage & the adorable deer! Great card! Love the background. 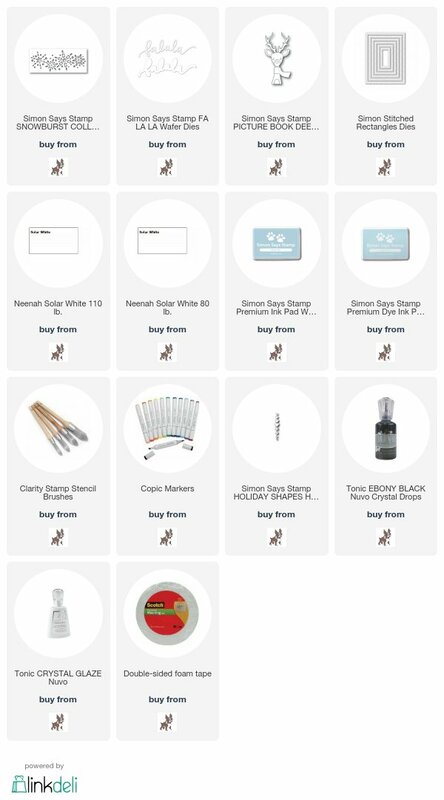 One of the reasons I love these blog hops is so I can see the many ways these items can be used. I am overwhelmed by the variety you and you fellow artists create. Really cute card. I love it! I love your little deer; he has such a wonderful quizzical expression on his face! The little clusters of red stars set him off beautifully. Thanks so much for sharing. Oh my goodness Amanda this is sweet. I love everything about it .The background is beautiful and your colour choice is fantastic behind the cute little deer. Well done. That deer is just the cutest thing! And I love your color combination, too. The falala die is my favorite part of the new release. Love your card. What a great background and that little deer is just too adorable. Love this reindeer card. It is so cute. Such a cute card, love it. Super cute card. I love that picture book reindeer. I love these picture book dies, very cute card Amanda!! That deer is just so precious! Beautiful card! I just love this deer. I have seen it used several times & all are fun. I love the colors & bright red scarf you put on him. He looks like he has something to say. So cute. I like the background and the framing. That little reindeer is adorable!!! I love your card. So cute!! What a fab idea for the background - love it. Well hello little reindeer.... he is so cute, and I love the character you brought to him with his shiny eyes and nose. I also love the way you layered your sentiment over the corner, such a great idea. Thank you for sharing. That deer is just so cute! I like how you combined various items from the new release on your card. Your card is so fun! I love this deer combined with the new background and the fa la la die. They look fantastic together! I am so lovin' that little deer. Your card really highlights his sweet face! Awesome background and adorable deer! Darling card! That card is wonderful!! You do excellent work. How creative. Aww, what a cute card! This is the cutest! You rocked these awesome dies! Such a cute card! I have to remember to make frames like that more often. Awesome work! I love your card. The background is awesome and that deer is adorable! That big sentiment is fabulous! Gorgeous card! I love that little deer and you’ve colored him beautifully! Thanks for sharing this super-pretty card. I really love your white, soft blue and vermillion colour scheme - perfect for a modern Christmas! Adorable card! I can see this little deer will be a favorite. I love that background too. love all these cards but it's killing my wallet - i have to have all of the stamps and dies! I am loving how everybody is layering these Dies... super cute! Your fantastic background really makes the deer & the words pop off the page. How adorable! You did a great job on your sweet reindeer card. I totally agree, that's the cutest deer ever !!! I love what you did with all the dies! Very creative and cute card! This is SO cute. Love how you framed it. So cute! Love how you framed up the deer and the pretty background. Delightful card! Very cute! Love the background you created! Pretty & fun card!! I love your use of the Snowburst collage multiple times for the background and your red stars as accents to match the reindeer's scarf! That little deer is just the sweetest and I love that die cut background you created for him! Oh your coloring on that precious deer!!!! I love this card and the reindeer card. Really adorable. Gorgeous background you've created for your cute little reindeer! I agree that these picture book dies are so adorable. Love your card and how you used all dies on this card. I love that cute deer too and that they gave him such a long scarf to add color to the user's card. You did just that with your amazing card. Thank you for sharing. So much dimension! love your card! Sharon C. Thanks for the inspiration using two of my favourites from the release. Fabulous card! Love the popped up frame. Love all the techniqups you used for your card. Gorgeous card! I adore the background! What a fabulous card! I love the background with the snowflakes and the adorable die cut deer. The layers on this card make it perfection! I never would have thought do mix and match the way you did - thanks for all the inspiration! I love what you did with the snowburst die. It's the perfect background for your adorable little deer! Thanks for sharing your creativity with us. Adorable deer! Thanks for the inspiration, love the background too. Thank you for sharing, I love watching your videos and seeing your creations. Simply adorable. Thank you for sharing. Me encanta como contrastan el reno y su bufanda con el fondo, preciosa tarjeta!! I agree that this storybook deer is adorable! !